I have made this Many Clove Garlic Chicken in the crockpot many times. It uses a delicious jar of garlic simmering sauce from Trader Joe’s. It is light and healthy. My house smells amazing when it is cooking. It really is a a super simple meal. I have heard all the rage about kale and my friend Kim was telling me that her family tried it recently and really liked it. The health benefits of kale go on and on. It is a low calorie food. It is an excellent source of iron, Vitamin A and C. It has more calcium per calorie than milk. It is also an excellent anti0inflamatory, fights cancer and is filled with fiber. Knowing this, I have to come up with some easy kale recipes! While we were at Trader Joe’s this week, I grabbed a 16 oz bag of their frozen kale. I prepared the Crockpot Many Clove Garlic Chicken just like I did before (which is a simple two ingredient recipe) but this time added the full bag of frozen kale over the chicken and sauce when I tossed it in the crockpot. My chicken breasts were even frozen! I set the crockpot on high and cooked it for 5 hours. When it was done, I cooked 1 and a half cups of rice on the stove in 3 cups of chicken broth. I served the chicken and kale over a bed of rice with ladles of the garlic sauce. It was amazing and so healthy. 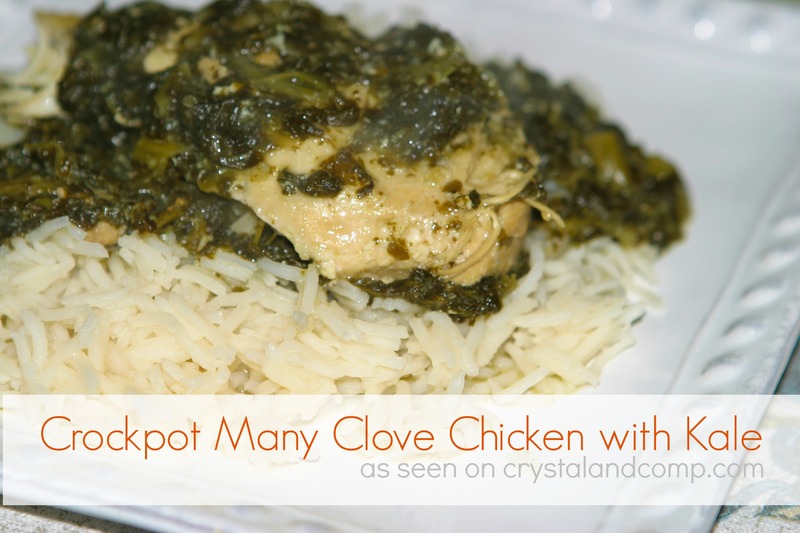 Click here to get the Crockpot Many Clove Chicken recipe and just add frozen kale to it when you pop it in the crockpot. It really is that simple! This recipe is perfect for busy (and healthy) families!